When expanding your business globally, an on-premise solution may be your default choice for greater control and flexibility. Traditionally, companies licensed enterprise software and then implemented it “on-premise” – for their own or controlled physical location – and provisioned the hardware, infrastructure and support to set it up and maintain it for employees. SaaS solution, on the other hand, is “software that is owned, delivered and managed remotely by one or more providers. The provider delivers software based on one set of common code and data definitions that are consumed in a one-to-many model by all contracted customers at any time on a pay-for-use basis or as a subscription based on use metrics. But, before you’re tempted to go down this path, it’s worth considering which solution suits more for your business. With SaaS solution, you precisely pay for what you need without having to buy hardware to host your new applications. Instead of furnishing and using limited internal resources to install and maintain the software, SaaS vendor provides all the hardware and implementation services and performs much of the work to get their software working for you. Additionally, the pricing structure for a SaaS solution is typically very flexible, depending on your needs. Monthly fees are all inclusive of maintenance and service which often lower the cost compared to the on-premise software. This flexibility in pricing can make a big difference in the ability for Sales or Marketing to budget, afford and get approval for a specific application or tool. SaaS and on-premise solution have essentially different funding models. On-premise traditionally has been treated as a one-time capital expense that is automatized over the lifetime of the assets. So it generally requires an upfront payment, either directly from the company itself or through a lease or lending from the company. Cloud computing allows an entirely different model: On-premise Expense costs are treated as operating expenses, on an ongoing basis. In many cases, the on-premise expense approach can unlock investment that can be used to transform the business. That being said, it is a cycle that continues year after year after you make the commitment, to understand this was in your planning. SaaS software also gives you the benefit of predictable costs both for the subscription and to some extent- the administration. Even as you scale, you can have a visually clear idea of what your costs will be. This allows for much more accurate budgeting, especially as compared to the costs of internal IT resources needed to manage, maintenance and upgrades issues for an owned instance. 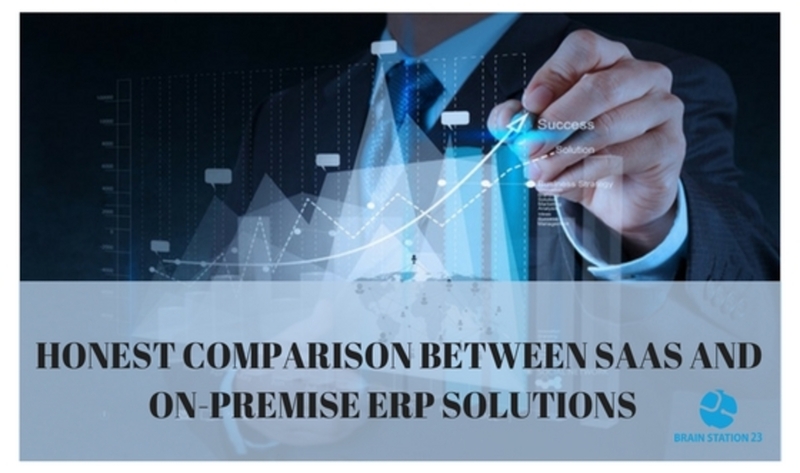 SaaS solution enables you to scale rapidly compared to an on-premise solution. If you’re looking to expand to other territories or in a rapid growth mode, SaaS can simply add more servers and capacity according to your need considering your network load as well. On the other hand, if you have a high peak-to-average load ratio, on-premise would require a significant infrastructure investment to handle the peak and then that investment would be underutilized for much of the time. Generally, on-premise software is more customizable than SaaS because vendors have built more comprehensive software development kits (SDKs) for these systems Most of the companies customize their software to some extent to meet the needs of the business. This is changing somewhat, with SaaS more configurable today then it was 5 years ago, still not to the level of on-premise. The flip side of this is that companies using SaaS can standardize their business processes, and often see a performance improvement since the new processes are generally more up to date with best practices with time. 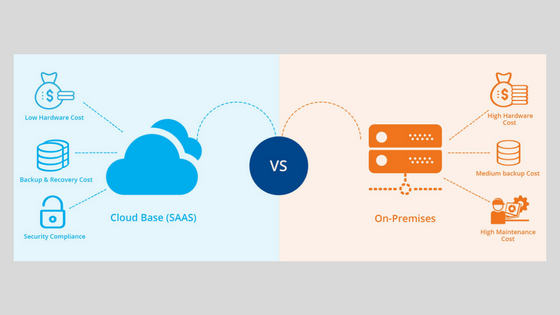 The time to a working solution is almost always much shorter with a SaaS vs on-premise option. A deployment that might take months to the traditional on-premise model shrinks to weeks or days or even hours with the SaaS model. This is due to the time lags associated with internal IT provisioning software and necessary hardware and also due to competing projects for IT’s time. So your application deployment gets put in the queue. Under the SaaS roof, since the software is hosted by the vendor, they take on the whole responsibility for maintaining the software and upgrading it, ensuring that it is reliable and meeting agreed-upon service level agreements by keeping the application and its data secure at the highest level. While you may worry about security outside of the enterprise walls, the likely truth is that the vendor has a much higher level of security than the customer’s enterprise itself would provide. Many SaaS providers have long-winded instances in very secure data centers in multiple geographies. Also, the data are being automatically backed up by the vendor, providing additional security with peace of mind. Additionally, you’re getting the added benefit of at least some disaster recovery because of the data-center hosting. Since SaaS software is hosted in a private cloud and accessible server by the Internet, users can access it via mobile devices wherever they are connected. The scope of accessing cloud applications from anywhere in the world may allow far more flexible work patterns. Your people don’t need to be tied to a physical office or VPN. That being said, there may locations where wifi or Internet access is not reliably available, though these situations tend to be more rare with each passing year. If this is the case, an application that is only available online may be a show-stopper. Does it have the expertise & strength to run the business in future competitive market? The size of of the company? What other kinds of customers do they have? If you see other companies like yours on their customer list, this tends to reduce risk. We Brain Station 23, being one of the leading software development company in Bangladesh, providing development facilities since 2006 with the help of our most talented team of people. Stepping forward with the newest technologies, we are providing ERP solutions to our local clients since 2016. We have clients all over the world which makes our portfolio weighted with global recognition. We are one of the few vendors in the Bangladesh to offer end-to-end services & solutions to our customers. From eCommerce to enterprise software development we have a strong footprint over the most competitive businesses and markets both globally and locally. And now we are receiving requests for more customized software with specific modules which has lead us to start working on SaaS models. In addition to providing a multi-tenant SaaS platform, we will also provide the vital back-end support, marketing services and global expertise to facilitate your worldwide business expansion with a faster route to global markets and lower upfront costs. Our proficiency and back-end capabilities will keep you on winning course by safely navigating you through the many complexities of global commerce. To reach for any further query on SaaS products ping us anytime . We will be happy to answer any of your questions. You can also Email us to get the PDF of our SaaS module features. Rather through SaaS- invest gradually with the visible change of growth. PrevPreviousCRM Solution for Businesses: Basics With Industry Assessment!